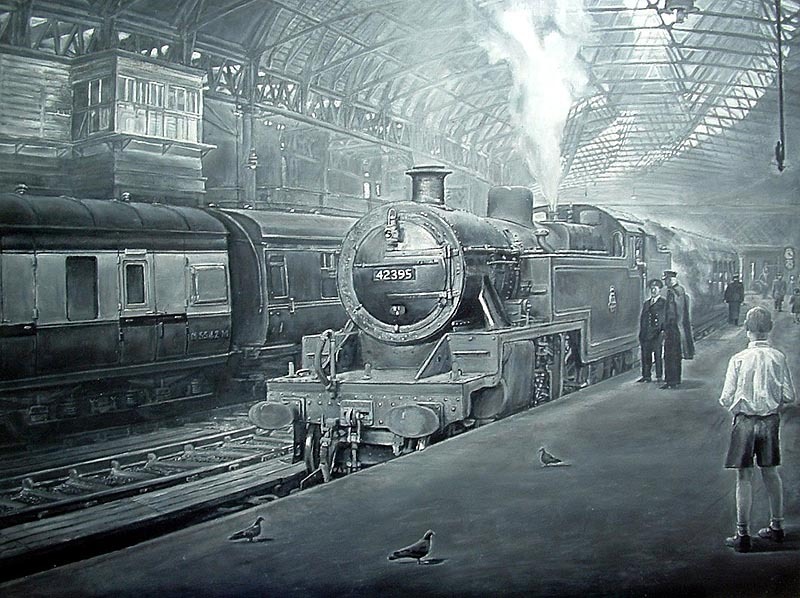 A train spotter cops ex-LMS 2-6-4T No 42395 standing at Platform 4 in the Midland portion of New Street station during the late 1950s. The locomotive, built to Sir Henry Fowler' design but with Sir William Stanier's modifications in September 1933, is waiting to depart on an all stations to Lichfield service. One of the most obvious visual modifications was the fitting of side windows to the cab. In total the LMS built 125 locomotives of this class from 1927 to 1933. Kevin writes' train spotters were very often in awe and wonder at looking at steam locomotives. They have a greatness about them and the aroma of steam in the air is something special to inhale. To me, they are almost like a living thing. I do remember well the confines of New Street station. Attractive though it was at the time, the smoke, steam and smell was unhealthy to breathe. Train spotters seen at the station ranged from school infants to adults, with many boys wearing school uniforms as they had come straight from school. Original painting and prints are for sale from Kevin, the artist on 01926 332708 or 'parrish@quicknetuk.com'.